What is a pin vice drill? You can see this really useful tool and how it works in the following video. 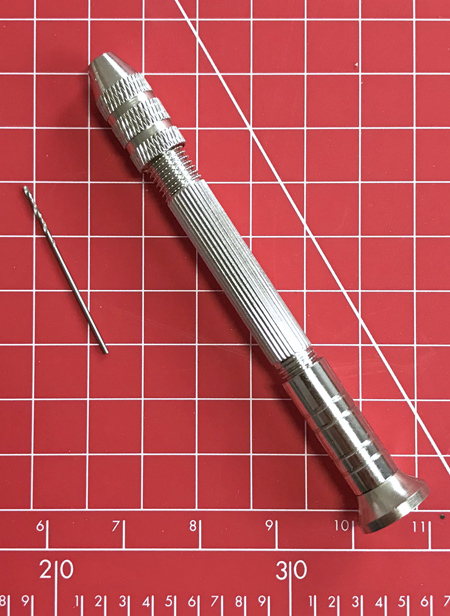 Essentially it is a metal body, a bit like a pencil with an adjustable drill chuck at one end in which you secure different size drill bits and a rotating circular disc that pushes back into your hand when you use it to drill out holes. •	anything else where you want a nice clean hole! Pin vice drills are available from many sources and in different sizes to suit different modelling tasks and so it’s worth looking around to expand your collection. Humbrol have chosen a sensible small to medium size chuck and in their set they include a 1mm drill bit. Look out for some really inexpensive sets of small drill bits that you can use for multiple modelling tasks. Mini Spares Box – do you have one? Thinking of trying a resin kit or accessory? While the hints, tips and advice in Scale Modelling Now magazine have worked for us, no guarantee is given that they will always work, that they are applicable to you or that there may be Health & Safety issues if you do follow the advice. It’s very much up to you to decide if you want to try them out. All relevant safety regulations regarding knives, adhesives, solvents, paints, etc. are implied.